Every now and then, you get lucky. You grab a four leaf clover, you spot a rainbow, you find real friends amidst the people you work with. Don't get me wrong, it's easy to find professional commonality with colleagues but to find someone who can dissect last night's Game of Thrones episode with you and also thinks this internet meme hilarious? Yup, pure luck. See, I am super blessed to work in an office full of young mammas. There's nothing that bonds women together like spit-up on suits or harrowing tales of 3am wake up calls. It's also a huge relief to know someone has your back when you're home battling projectile well-you-know with a sick baby. But more than the comfort of having young mammas as colleagues, I'm glad to be able consider these women my friends. Recently, my two office besties announced they were BOTH pregnant. In between always looming filing deadlines and legal briefs, plans for a potluck baby shower were hatched. When planning what I'd bring, I started thinking about what I missed most when I pregnant. And before I could even finish that thought, I thought of coffee. Gosh, I really really missed my two (okay three) cup a day habit. Even though I didn't drink coffee, I made sure to have as much coffee ice cream as I could. And no, that's not the same thing as coffee! It's not, okay! But I was also torn because really, what party is complete without cake? Not a party I'm at, that's for sure. Coffee? Cake? Clearly, the answer was to combine the two. I discreetly checked with office besties if they were okay with having coffee desserts while with child and upon confirmation, started concocting plans for some sort of coffee-spiked cake. The problem is, I have a crazy long commute to work on public transit surrounded by business folks jostling their briefcases and high school kids flailing their arms about to whatever crazy song is on their headphones (and yes, the Hubster has already identified my crabby Mr. Wilson leanings. It's only a matter of time before I yell at Dennis to get off my lawn). So, a layer cake was out of the question. A coffee cake didn't feel festive enough and a sheet cake too blah. And then I remembered reading about a phenomenon known as the ice box cake. Cookies, layered with flavored freshly whipped cream and refrigerated so the cookies soften to a cake-like consistency. Truth be told, I wasn't sure this whole mocha ice box cake thing would work. But I carried on, for science! I layered graham crackers with a decadent chocolate ganache and a chocolate and espresso spiked whipped cream. I carried it to work on public transit, daring the business folks and high school hooligans to come near my dessert. And before the party, I snuck a tiny spoonful from a corner, hoping the components had done what they were supposed to. And they had! It was like magic! Cake magic spiked with coffee (which is really how all magic should be, in my opinion). And so, on an uncommonly sunny day in San Francisco, the ladies of our office gathered on the patio to celebrate motherhood, and most importantly, friendship. We laughed about delivery room horrors and mommy sagging (precisely why I said, the ladies of my office gathered), about babies big, small, and ones still on their way. And most importantly, we ate cake and toasted colleagues who are lucky enough to be friends. To make your chocolate ganache, chop chocolate in small pieces and add to a bowl. Heat heavy cream on the stove until cream just starts to boil. Immediately pour cream over chocolate and mix until ganache is smooth. 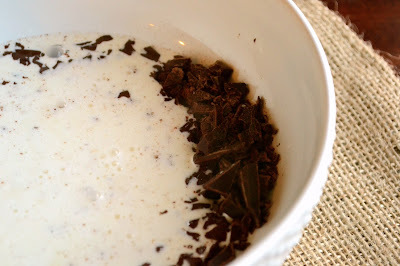 To make your mocha whipped cream, add all ingredients to a mixing bowl. Whisk on low speed until soft peaks form. Thereafter, raise the whisking speed and whisk until you have firm peaks. It also helps to refrigerate your mixing bowl beforehand and make sure the heavy cream is cold. 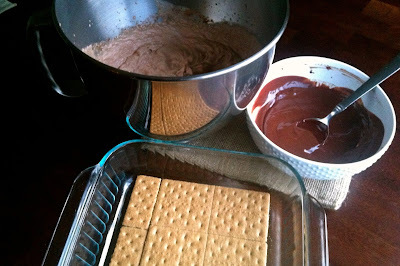 Add a single layer of graham crackers in a serving dish. Top with chocolate ganache and mocha whipped cream. Repeat layers until you have 3-4 layers, ending with the mocha whipped cream. Drizzle with melted chocolate, top with chocolate shavings, or dust with espresso powder (or all of the above)! 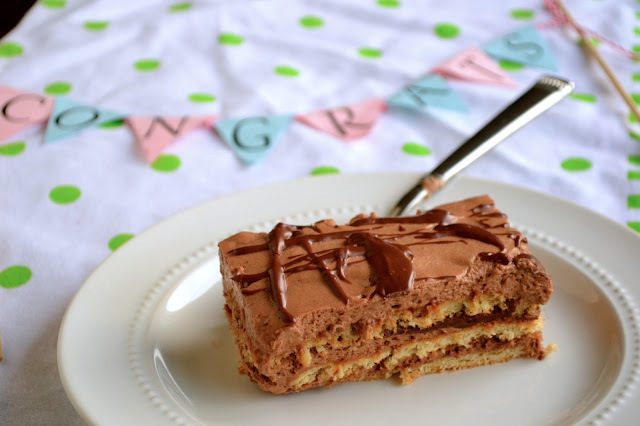 Recipe adapted from Ina Garten's Mocha Chocolate Icebox Cake. this sounds heavenly.I was drinking way too much coffee but now I m a tea person however I am still a sucker for anything coffee flavored. Having girlfriends around is so important :) Do you have a recipe for chocolate espresso whipped cream? love love love this idea!!!! I have never ever made one of these, perhaps it's time to start. You sure are lucky and a day in SF with this cake sure seems like fun. Sucker for coffee, this is so perfect. Nice to meet you too.. Some of my best friends were work colleagues at one time and some. I've known for 18 years! I am all for coffee and coffee spiked cakes. This looks fabulous and something to try for a make ahead gathering. I need a thing for an Iftar soon, this maybe perfect. Thanks! Hope Ramadan is going well for you. I hated having to quit coffee with my first one! Now, I'm loading up on coffee before I have a second child. Its the only downside to being pregnant (given how easy my pregnancy otherwise was)! Also, do we all have a lot of pregnant besties around us? I have 3!!! The ease of making this cake - with cookies, is right up my alley! I think pregnancy is contagious sometimes. So glad you have a fun office, I kind of miss those days and then I remember my 15 year old is still just like a toddler and I'm completely over it. I could use a little icebox cake in my life. Hope you are having a good weekend. I am SO going to make this cake! Easy, transportable and delicious...coffee and chocolate...right up my alley!! Mommy sagging...sigh. Unfortunately I can relate to that! Wish I had cool people to chat about it with! Happy Ramadan Day #20. Here's hoping it flies by for the both of us! Work truly does become fun if you've got nice people around.. This cake looks like the perfect way to celebrate, and well, no work day is complete without a few shots of coffee! Yay for a fun work environment! It sounds like you're working with some awesome people. And this icebox cake looks delicious! I'll bet it was the hit of the party (and looks super complicated!). I have never eaten an icebox cake but heard about it. This looks incredible! Need to bake this soon! It's lucky indeed to have friends with similar interests at the workplace. The cake sounds divine and easy to make. Bookmarking. I agree it is so lucky to find true friends with your coworkers. I am sure they appreciated and loved that mocha cake, I know I would! This post made me smile so wide. I completely agree with you...there is nothing better than bonding with other mamas. You are blessed! And this cake? Well it looks just delicious, my friend. Thank you for sharing it with us! Oh yum, the flavours remind me of tiramisu. Some friends are better than family. ah - i need a friend like you! No one made me cake when I got pregnant!! I'm not a huge coffee or tea drinker so I didn't miss much of anything but more than hot - I love my coffee in all things cold and cake. A cake that can make it through a ride on public transportation and be deliciously good is a real keeper. Wow, sounds delicious...I cant wait to eat this,I'll definitely try to make this.